Company : AKT Investments Inc.
History : AKT is a diversified, family-owned, land investment company headquartered in Sacramento, California, operating real estate, farming, ranching, water and minerals, building, and land development projects throughout North/Central California. Founded by Mr. Angelo K. Tsakopoulos, the firm has been a major benefactor in the development of the region for the past four decades. Not surprisingly, the large number of independent investment holdings in the portfolio requires the full attention of a capable accounting department. Business Challenge : The AKT accounting team had been interested in using QuickBooks Enterprise to replace a dated implementation of MAS 90. The features and ease of use of Enterprise was popular with the accounting team, however they faced a major challenge with converting a very large number of independent tax entities into Enterprise. With no conversion tools available between MAS 90 and QuickBooks, the complexity and volume of data needing conversion was prohibitive. Additionally, the accounting and management team required a number of real-time reports from individual entities to manage vendors and implement strategic checks and balances on disbursements across the entire portfolio of investment holdings. The team also had a strong desire to manage common vendor information (names, addresses, tax IDs, etc.) in a central location so that each entity could reflect up to date vendor information without having to open and enter the same tax ID, phone number or address change in every file. The project stalled for several months as the company sought assistance from many QuickBooks consultants who correctly surmised that no easy solution existed. The company turned to Turn Key Office LLC for help. Solution : Turn Key Office approached the challenges in separate phases. For the initial phase, we used a combination of off-the-shelf software utilities to import large volumes of data, chart of accounts, balances and “open” transactions. Using manual data entry only when necessary, we were able to create individual QuickBooks files representing each of the independent tax entities that provided very little downtime for the accounting team. Then we verified the financial reports and open transactions tied precisely to the corresponding entity file in MAS 90 as of the period end date. Next, we utilized an off-the-shelf solution and procedure to utilize a master vendor list and push updates into each individual file so the vendor names and contact list were consistent across all entities. Vendor contact information is maintained in the master list only. Finally, we turned to addressing the needs for consolidated reports. The embedded consolidated reporting feature of Enterprise fell well short of requirements because it had no templates or filters for the types of reporting needed. ODBC and Enterprise advanced reporting tools also fell short because they are only able to access one file at a time. 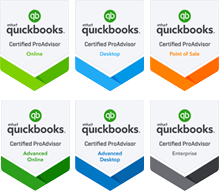 Finally, we chose off-the-shelf software programmed to mine the individual QuickBooks databases for the necessary data, and a custom report developed in Access to create reports required for effective cash and vendor management. Conclusion : Now the accounting team is able to manage separate entities with QuickBooks Enterprise, but have consolidated vendor reporting and a contact management system across the entire portfolio of investment companies, without having to open each individual file.